The Kenda Executioner is designed to meet the demands of the most aggressive 4x4 riding terrain. 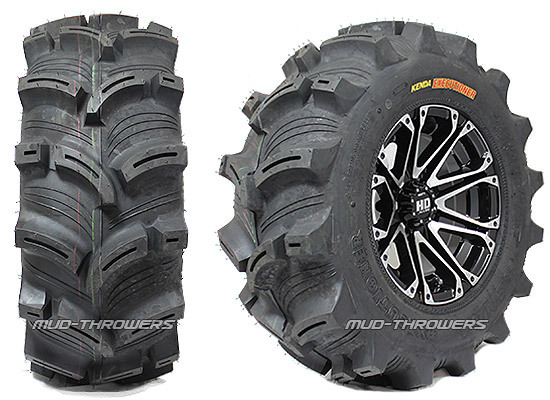 It's deep tread and open lug spacing will give the ultimate deep down traction, even in the muddiest conditions. Available in 25" to 27" for 12" diameter wheels and 28" for 14" diameter wheels. I've had these tires for about a year and a half and roughly 900 miles on a foreman 500. they have been great! they still look new, other than the mud stains. I've used them in all situations: rocks, mud, creeks, woods, highway, you name it. the only negative thing i could say about them is the weight, they are heavy. but pretty decent ride for a tractor tire, great puncture resistance, good in the muck. i just like em! I run these tires on a '13 foreman 500, have almost 2,000 miles on these tires now some pavement, snow, ice, creeks, and thick mud. Rear tires still half tread fronts still three quarter tread. Great tires! Great tire for mud and snow does amazing. Slide a lot on wet logs thou. All around great tire! Would deff run again if wasn't goin to 28s! Awesome trail / mud tire! Just picked up a set of 28x14 for my new 2015 Polaris Sportsman 1000. These blow away my Baby Back' X-Lites on my old 800. They dig better, have a smoother ride, and have a harder rubber compound with hard, stiff, deep lugs! They also run a true 28", no power loss with a clutch kit. The rim saver edge is a nice feature. Just a solid, heavy duty tire! Much more aggressive in person. Very pleased.